The collection has been built up since the beginning of the National Film Archive, i.e. since 1955. It is supplemented by donations from Polish and foreign institutions and individuals, and since 2005 the Law on Cinematography has required producers to transfer documentation materials to the National Film Archive. The collection consists of: scripts, film novellas, shooting scripts, editing and dialogue transcripts, credits, captions and subtitles, literary documentation from Polish films and, to a lesser extent, also from foreign films distributed in Poland, as well as films not distributed in Poland. The collection contains literary materials for most Polish films produced after World War II, as well as for unfinished or unrealised projects. This collection is an invaluable source of knowledge about the history of Polish cinema. Thanks to the materials gathered within it, we can see the changes that a film's concept undergoes from the pre-production stage and also find out about projects that, for various reasons, often political ones, never made it onto the screen. Many unrealised scenarios have become the object of interest among researchers over the last few years, and there are others still waiting to be discovered. 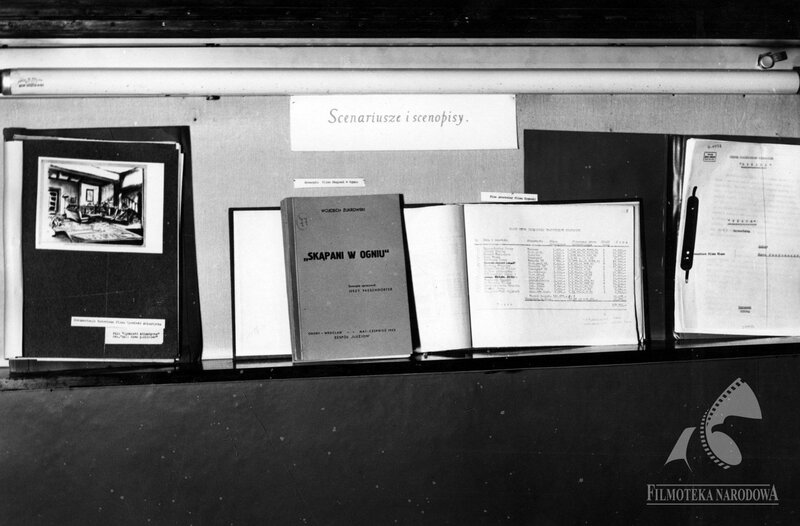 Literary materials from the collection of the National Film Archive on display to mark the Tenth Anniversary of the National Film Archive in 1965.